I’ve always been curious about this little building on Carrall Street. I’m writing the text for the Heritage Foundation’s Places that Matter plaques (with Michael Kluckner) and this is one of the selected locations. It’s been interesting to dig into the history and sort it out since the official Statement of Significance for the Louvre is quite wrong. This somewhat anonymous building in the 300 block of Carrall street has been the home of the Gospel Mission since the 1940s. The Gospel Mission in operation in Vancouver since 1929 is one of the oldest missions in the city. The Gospel Mission occupies a building built in 1889, its first tenants at street level were the Vancouver Drug Company run by Dr. James Rolls and the Vancouver Tea and Coffee Company whose manager is listed as W.A. Cumyow. Won Alexander Cumyow was the first Chinese born in Canada in Port Douglas at the head of Harrision Lake. He was secretary of the Chinese Consolidated Benevolent Association when it was founded in Victoria in 1884 and later its president in Vancouver. Cumyow would later become a court interpreter for the Vancouver Police and while in Vancouver he helped form the Chinese Empire Reform Association to promote the modernization of the Chinese monarchy. He worked in a variety of businesses including real estate and retail. The wall in the lane (once known as Louvre Alley) still features painted signs for the saloon and advertises clean beds for 20 cents a night at the Boston Rooms a few doors down the lane. 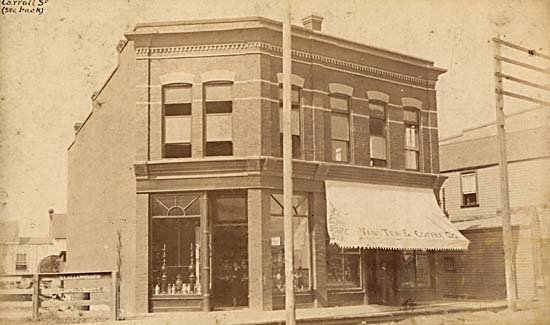 The rooms above the store fronts seemed to be operated as a rooming house until 1898 when they are listed as the Louvre Hotel. Fire insurance maps of the period show the hotel had six fireplaces when it was built. On the ground floor a variety of businesses including cafes, confectionary stores, barber shops and tailors come and go over the years. In 1940, the old Bijou Theatre next door to the hotel was torn down and, for some reason, included the demolition of a section of the Louvre Hotel that faced onto the CPR right-of-way at Carrall. It’s at this point the hotel disappears from the directories and when the Gospel Mission moves in. Next Post This is just too cool. Thanks. Still researching missions in the downtown.